Offering you a complete choice of products which include deflection of truss apparatus, elastic properties of deflected beam apparatus, curved member apparatus, three hinged arch apparatus, pin joint truss apparatus and two hinged arch apparatus. 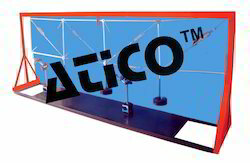 Advanced Technocracy Inc. is Manufacturer, Exporter & Supplier of Deflection of Truss Apparatus. Advanced Technocracy Inc. is Manufacturer, Exporter & Supplier of Curved Member Apparatus. 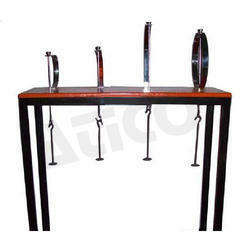 Apparatus consists of a steel bar which is used to make the different cur members Viz. circle, semicircle with straight arm, a quadrant of a circle and quadrant of a circle with straight arm. The bottom ends of the members are fixed to the base. 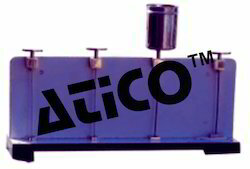 Under the application of load at free end, its horizontal and vertical deflection is measured with the help of dial gauges. A dial gauge with 25mm travel (with a magnetic base) is supplied with the apparatus. Experimental and analytical study of 3 hinged arch and influence line for horizontal thrust. The model has span of 100cm and rise 25cm, with hinges at supports and crown. One of the ends rests on rollers. Along the horizontal span of the arch various points are marked at equidistant for the application of load. This being a statically determinate structure, the horizontal thrust developed under the action of any load system can be theoretically calculated and will also be measured directly by neutralizing the outward movement of the roller end. A dial gauge with 25mm travel (with magnetic base) is supplied with the apparatus . 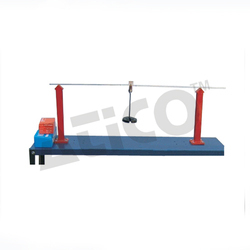 Apparatus is supplied complete with a supporting stand and a set of weights. Advanced Technocracy Inc. is Manufacturer, Exporter & Supplier of Pin Joint Truss Apparatus. Experimental and analytical study of 1 3 bar pin jointed Truss. Apparatus consists of three suspension members (spring balances) of different stiffness which are jointed at a point to form the redundant joint. The upper end of the suspension members being tied in a position to a vertical wooden board. Arrangement is provided on a paper and also elongations and forces in the suspension members by the help of dial gauges. 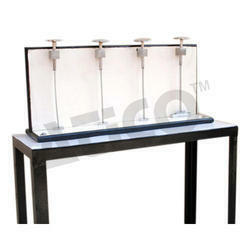 Two dial gauges with 25mm travel (with magnetic bases) are supplied with the apparatus. 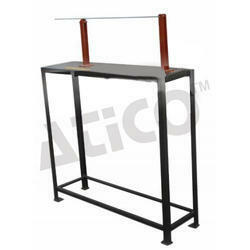 Apparatus is supplied completer with a supporting stand ans a set of weight. 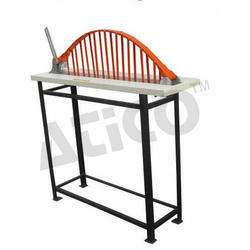 Advanced Technocracy Inc. is Manufacturer, Exporter & Supplier of Two Hinged Arch Apparatus. Experiment on a two Hinged arch for horizontal thrust & influences line for horizontal thrust. this end for the application of known horizontal inward force for measuring the horizontal thrust. Along the horizontal span of the arch various points are marked at equidistant for the application of load. This being a statically indeterminate. structure of the first degree. A dial gauge with 25mm travel (with magnetic base) is supplied with the apparatus. Apparatus sis supplied completer with a supporting stand and a set of weights. Advanced Technocracy Inc. is Manufacturer, Exporter & Supplier Behavior of Column and Struts Apparatus. 3. One end pinned and other fixed. 4. One end fixed and other end free apparatus is supplied complete with a supporting stand and a set of weights. 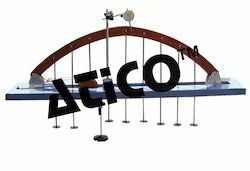 Advanced Technocracy Inc. is Manufacturer, Exporter & Supplier of Behavior of Column and Struts Apparatus. Experimental and analytical study of behavior of struts with various end conditions. Advanced Technocracy Inc. is Manufacturer, Exporter & Supplier of Apparatus For Verification of Clerk's Maxwell Reciprocal Theorem. Looking for Engineering Mechanics Lab ?